Meng Model company , while best known for their armor and aircraft kits, also produces some models of Japanese pick-up trucks in 1/35th scale. These trucks are “technicals” (a military term) for use with modern armor kits of the same scale. 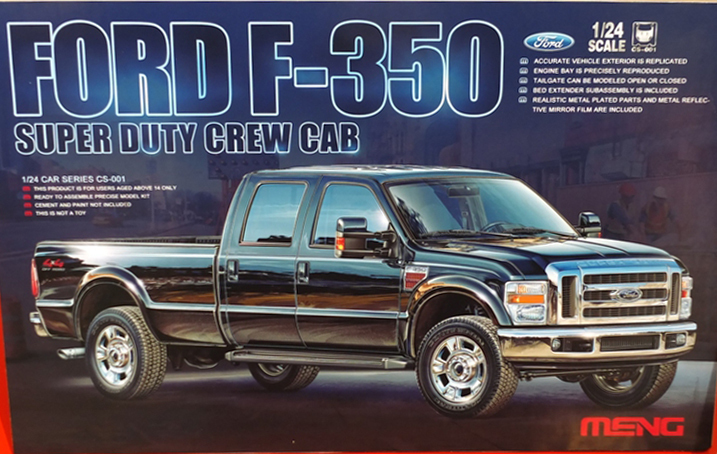 But at the recent Nuremberg Toy Fair, they announced their first foray in 1/24th scale automotive kits – a Ford F-350 pick-up truck! Going by Meng’s previous releases, this should be a great kit. Below is a list of model shows & contests (mostly in Texas and Louisiana) that may be of interest to HAMS members in 2014. We will update missing dates and info links as they become available. HobbyTown USA in Houston is Now Open! The new Hobby Town USA on Highway 6 in west Houston is now open (as of 10:00 am on Saturday, January 4). Finally. It is a very large store with a huge supply of kits and supplies. A good number of those kits are car/truck/motorcycle kits. They carry, Revell (US & Germany), AMT, Tamiya, Hasegawa, Fujimi and others. And that’s just the car kits. Probably the best selection of paints in town. Scratchbuilding supplies to rival G&G. They are located at 2392 Hwy 6 South, which is on the west side of Hwy 6, just north of Westheimer, and are open 7 days a week. I know they are not in a convenient location for many of our members, but they are the largest and best stocked of the three full-service hobby shops in Houston. They also have a frequent buyers card, so be sure to sign up for that if you go in.